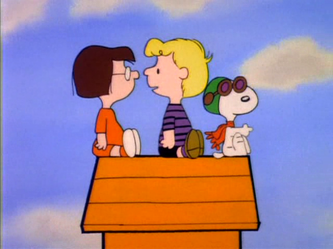 CBSS Page 5 - Snoopy And The Gang! 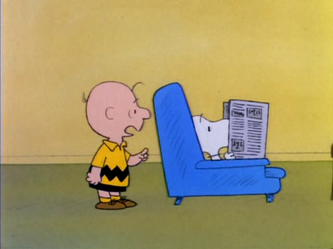 The Charlie Brown And Snoopy Show! 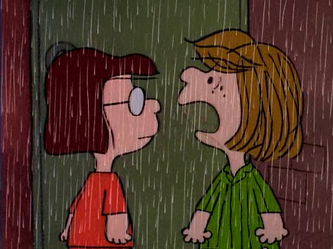 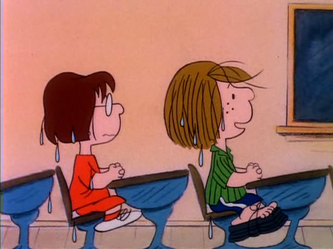 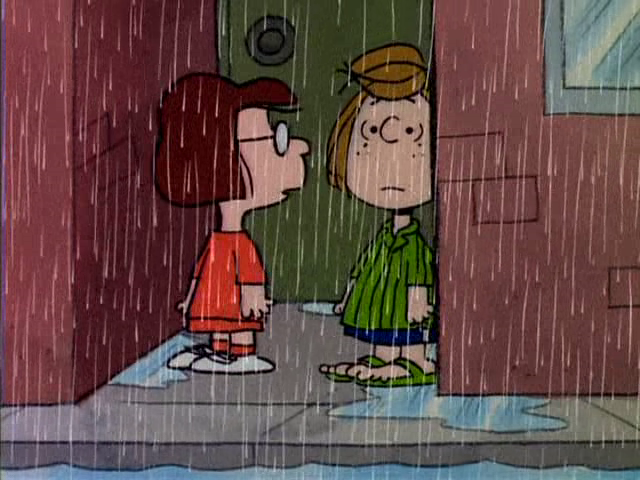 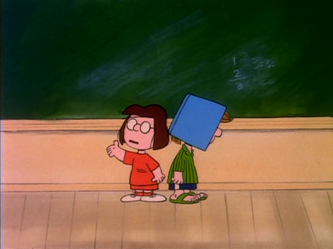 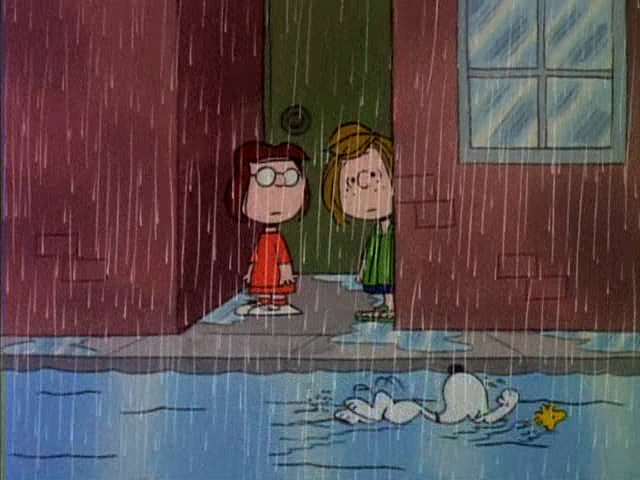 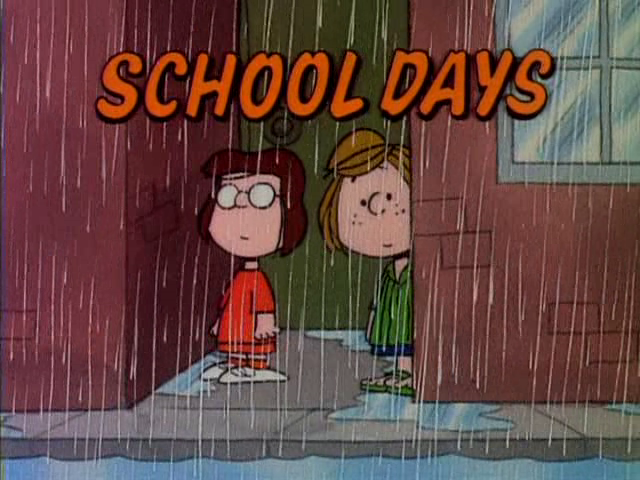 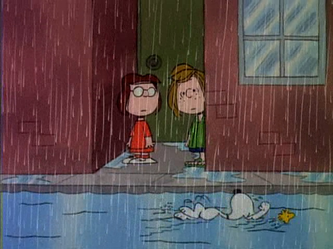 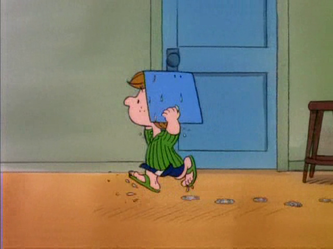 School Days - Marcie and Peppermint Patty have to go to school in the rain. They end up getting soaked, because they didn't know it would rain. 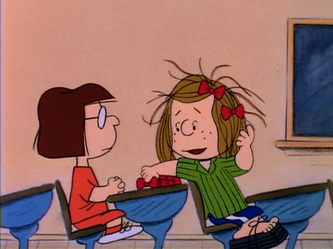 Marcie gets upset when Patty keeps asking her to borrow items from her desk. 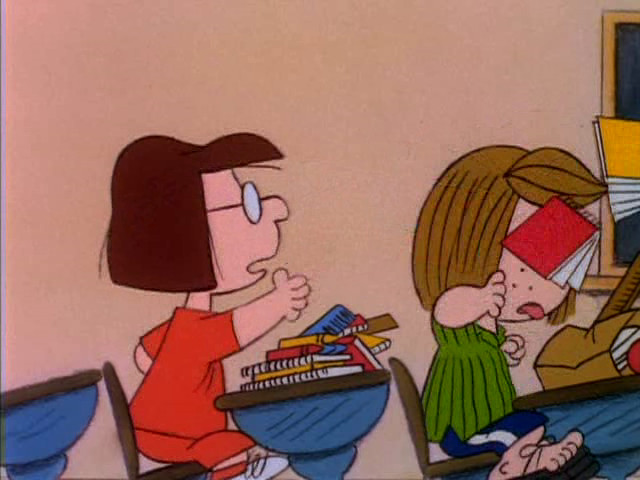 Patty tries to get in the teacher's good graces the next day by wearing a binder to school so her hair won't get wet, but it gets caught in her hair. Marcie takes advantage of this and does a report on Patty's head. 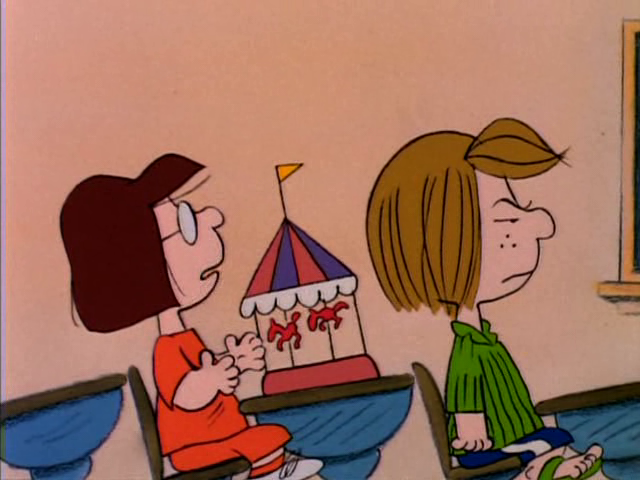 Patty doesn't go to school the next day because of all the D+ marks that keep flying at her. Finally, she comes back and wears a helmet. Later, she decides to wear a paper hat containing her report, and she gets a B+. 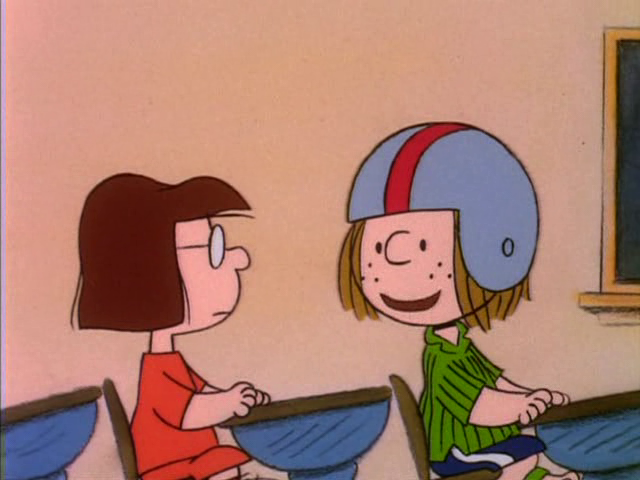 Marcie takes a cue from this and makes a bigger report and hat, getting an A+. 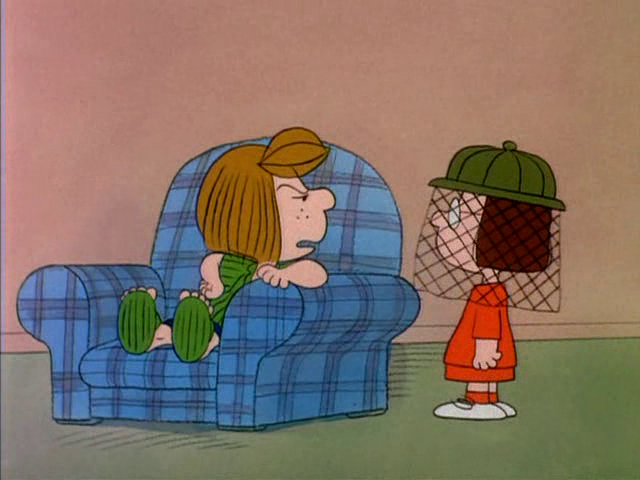 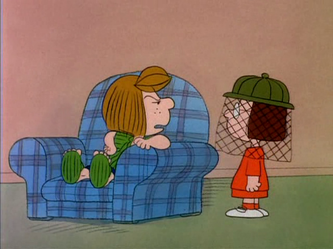 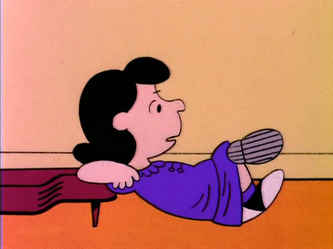 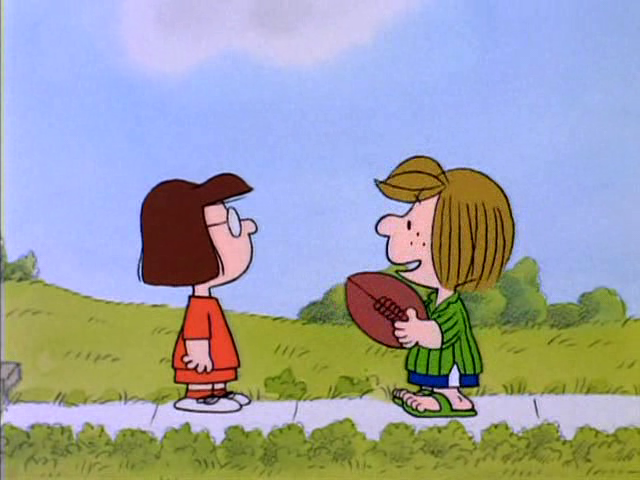 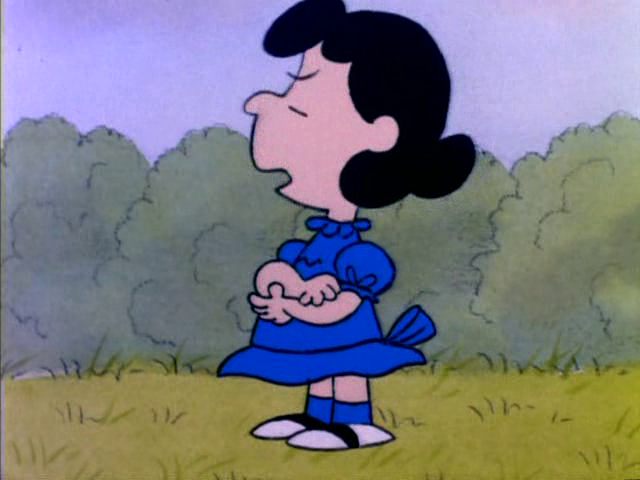 Patty gets mad at Marcie, and hopes she runs into a tree, which she does. 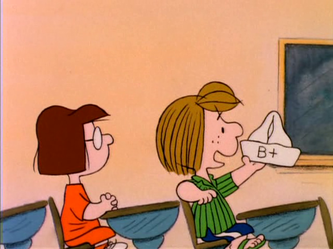 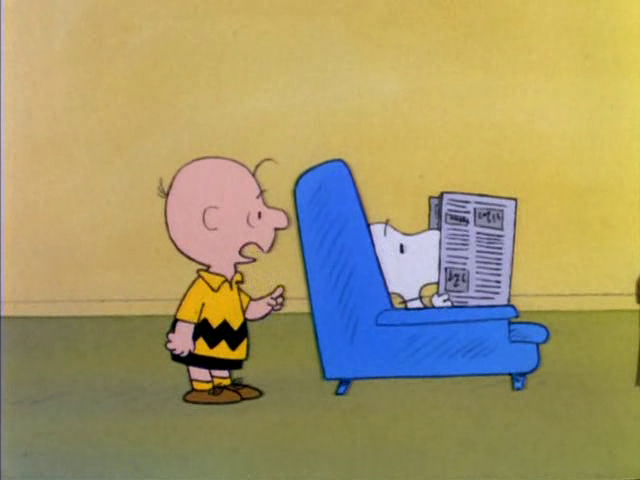 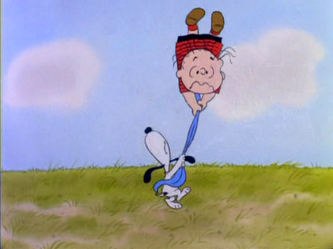 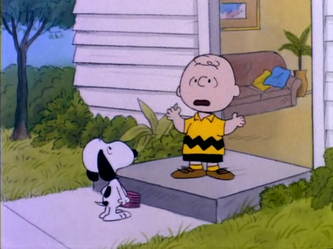 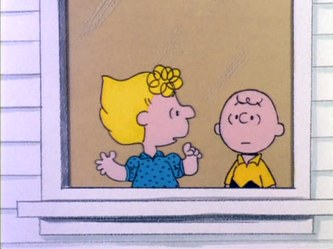 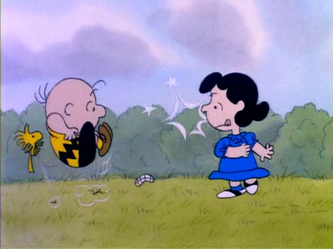 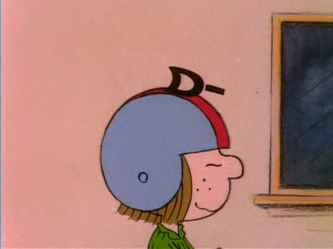 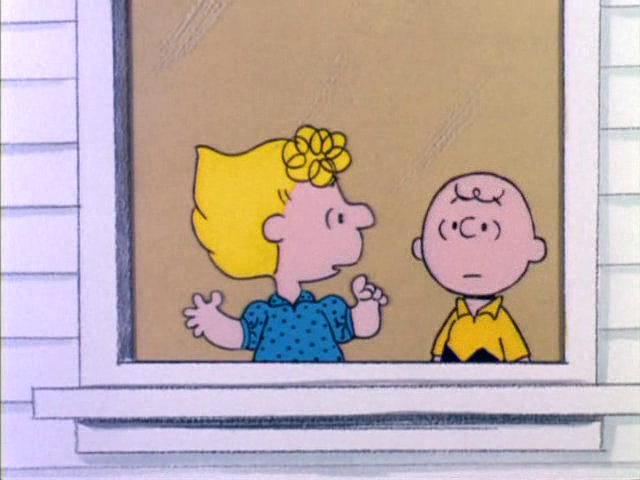 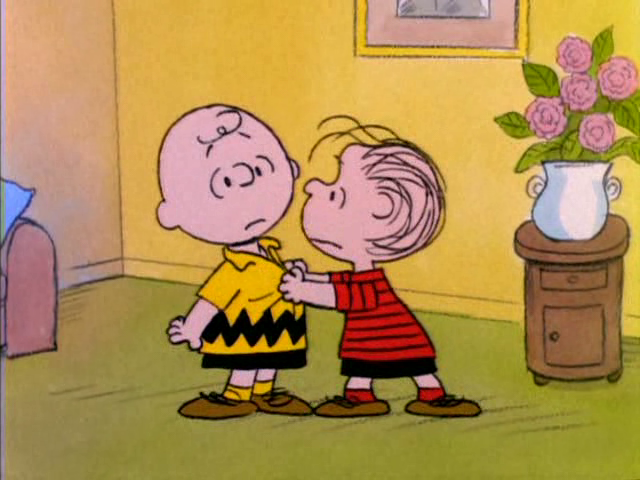 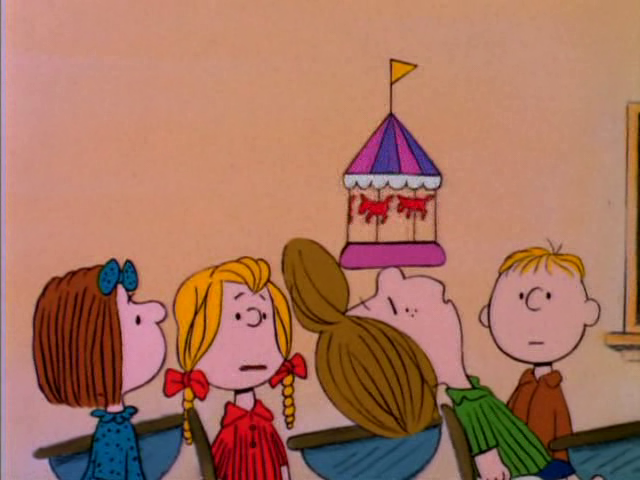 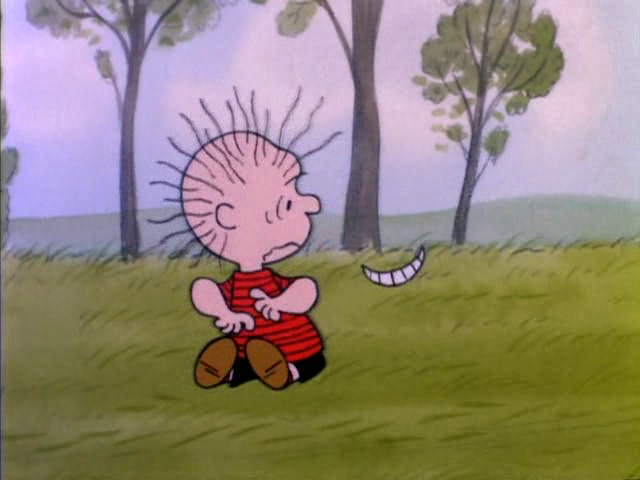 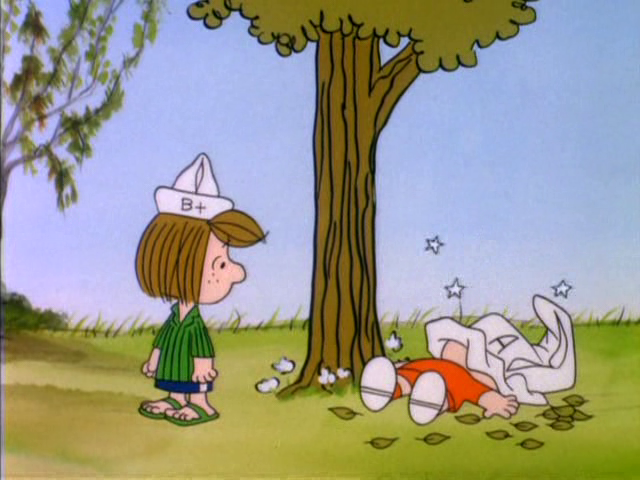 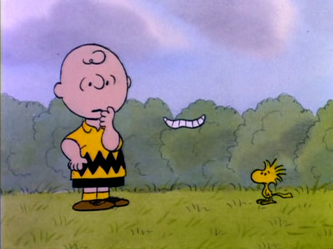 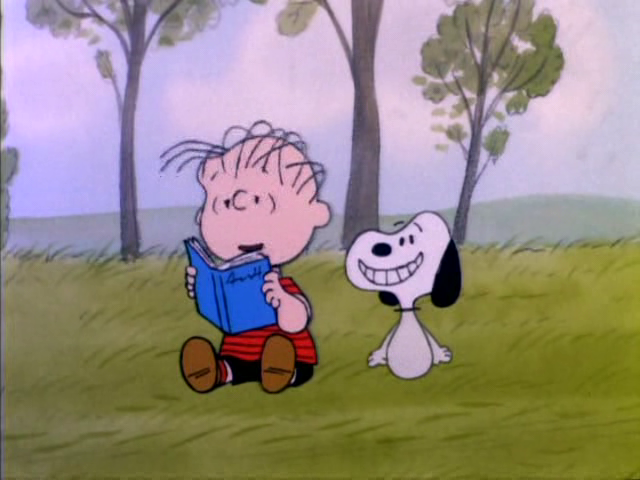 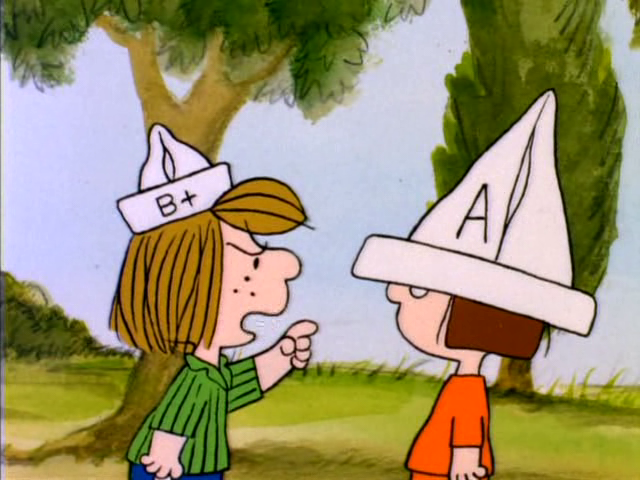 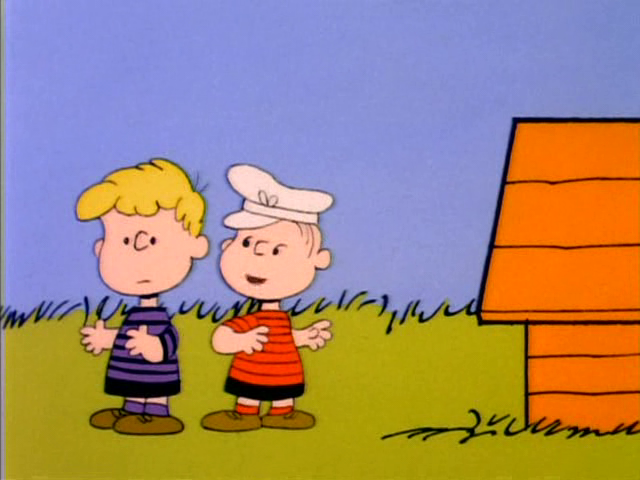 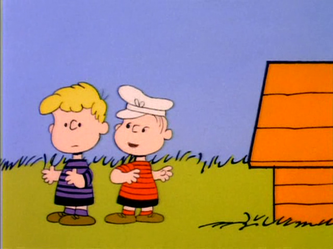 Soon everyone is taking after Patty, including Charlie Brown, hoping they get good grades. 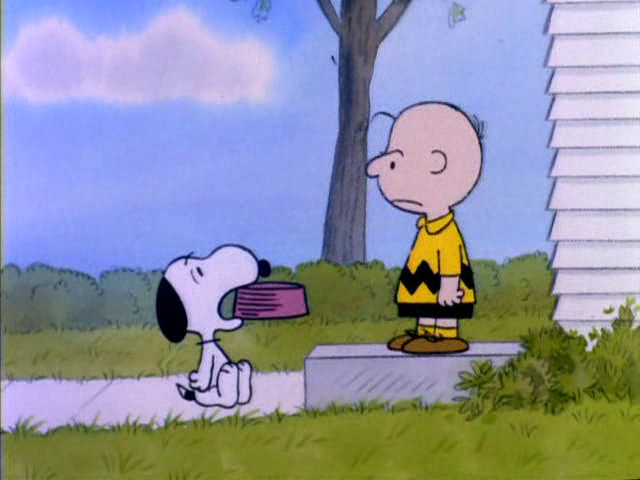 Snoopy's Trick - After pestering the kids one too many times, Charlie Brown has a talk with Snoopy, and then he tells him that there will be a system for eating, by holding up flags for different meals. 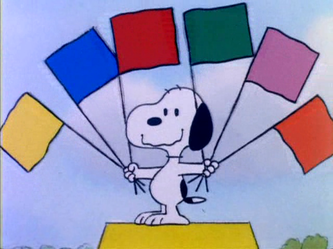 Snoopy decides to hold them all up at once. 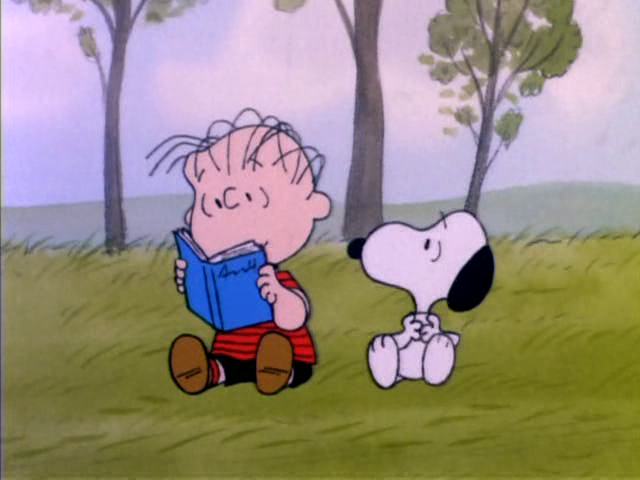 Charlie then has Linus come over and read Alice In Wonderland to him. 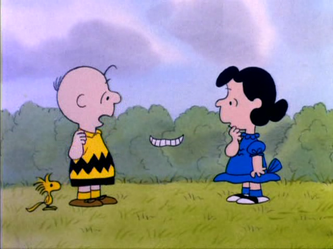 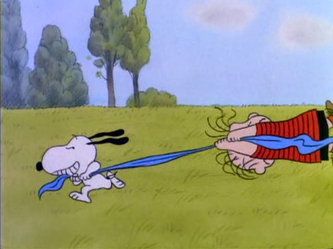 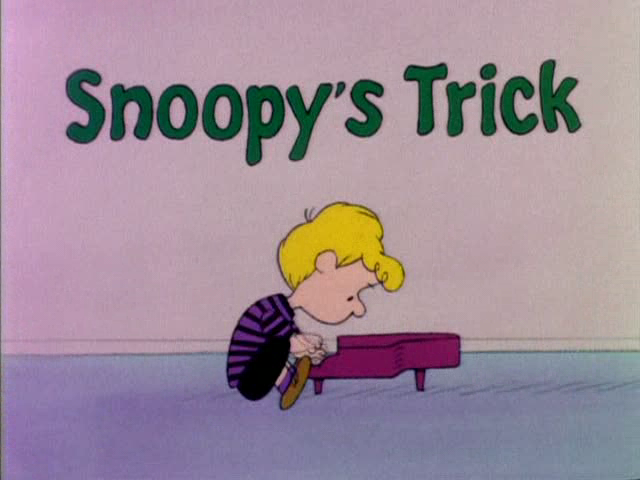 Snoopy then tries the Cheshire Cat trick, and succeeds. 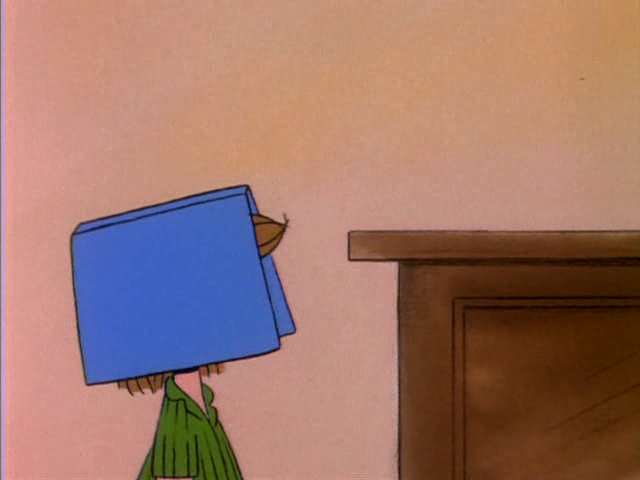 After showing it off one too many times, he gets stuck being invisible. 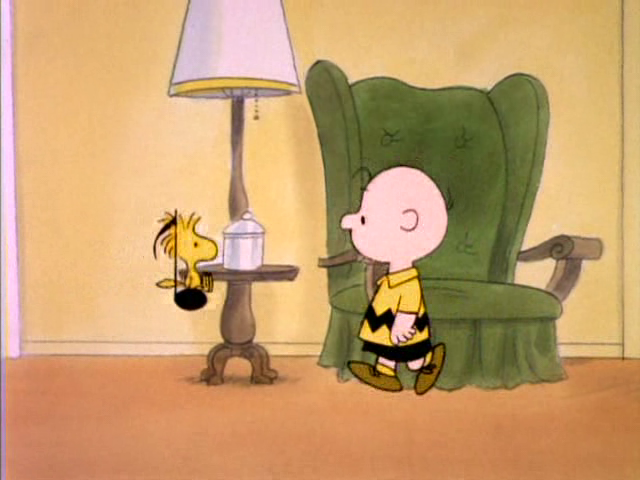 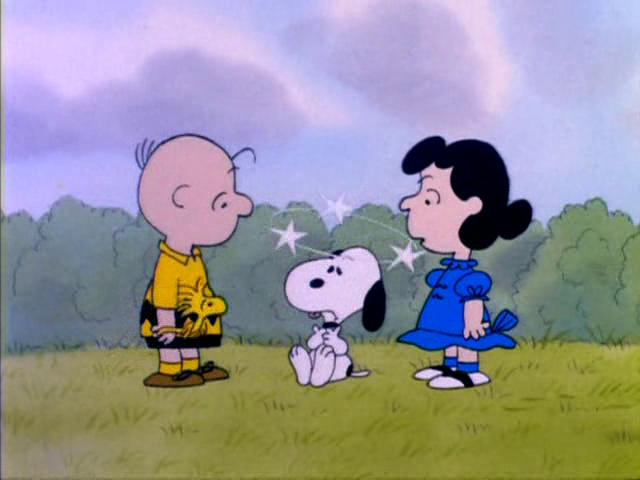 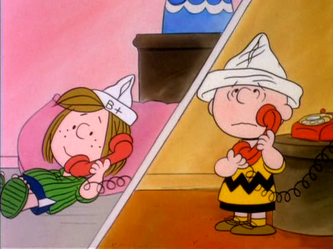 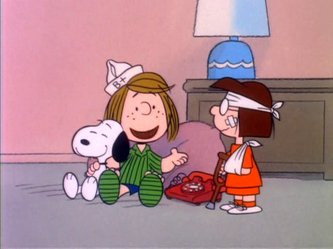 Charlie asks Lucy what to do, and Lucy fixes Snoopy like the way her family fixes the TV. 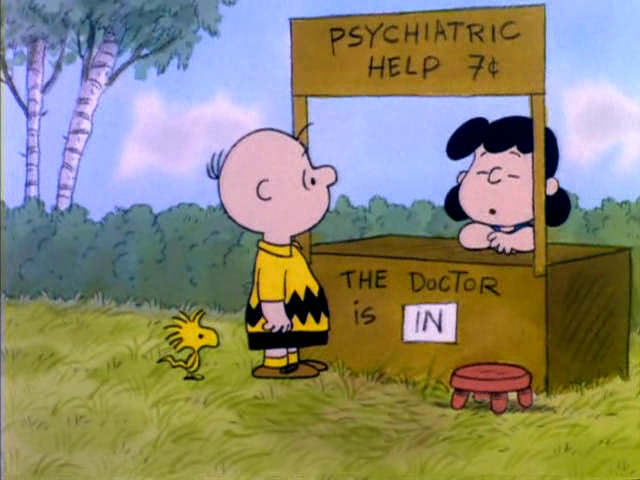 She charges $5 for the service, saying that it's cheaper than what the repairman would charge. 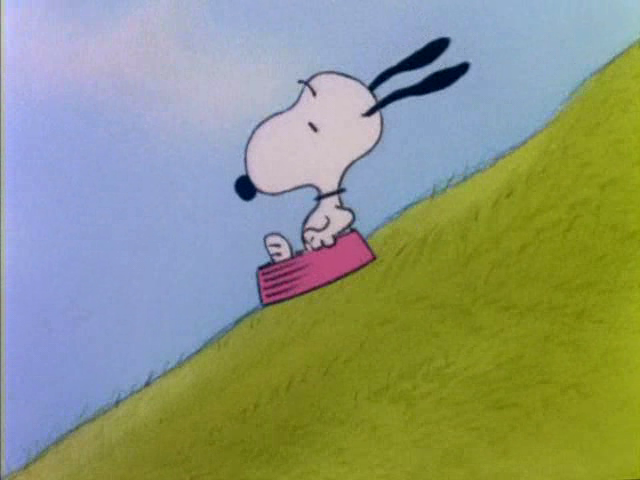 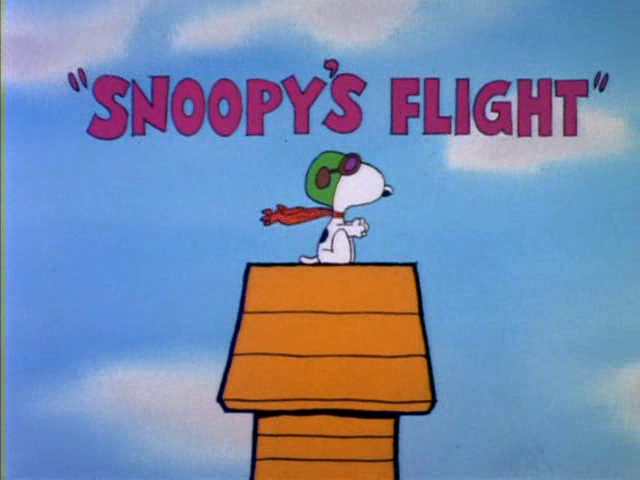 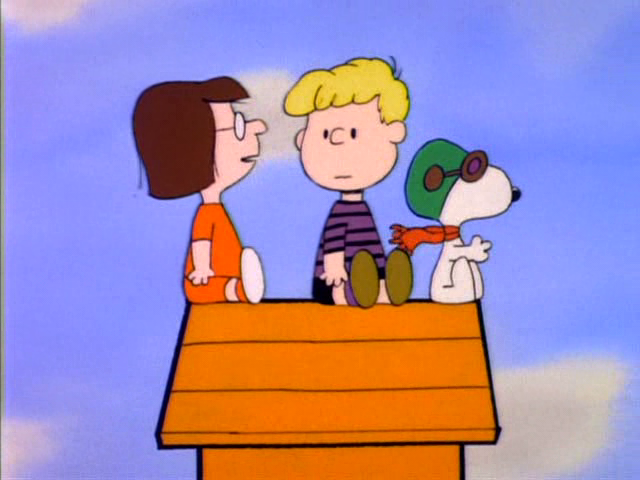 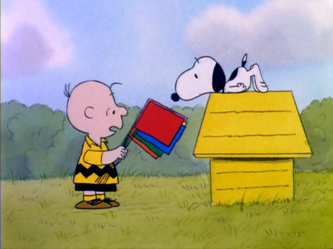 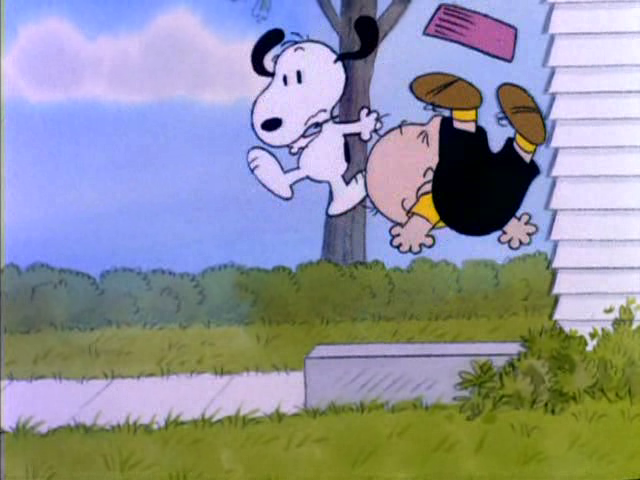 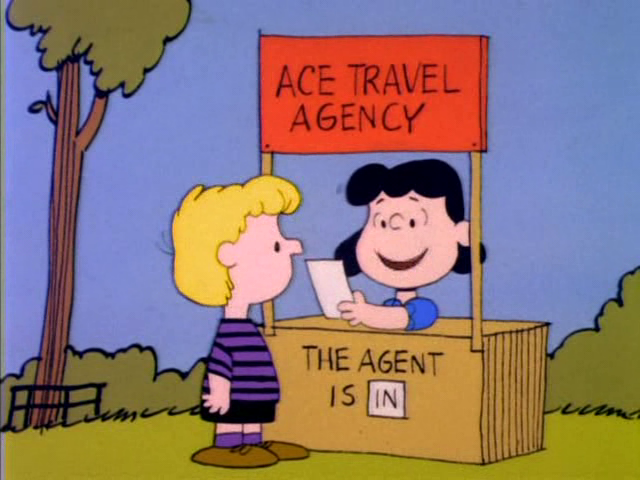 Snoopy's Flight - Schroeder wants to go to music camp, so Lucy books him a flight on Snoopy's airline. 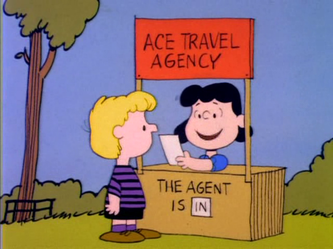 Marcie ends up being the stewardess, making announcements through the trip. 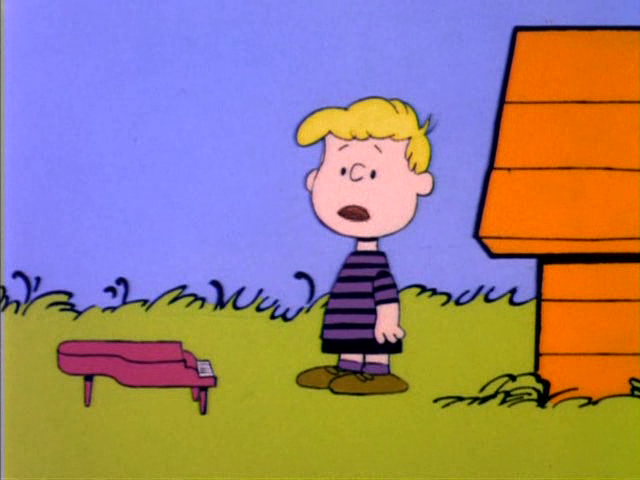 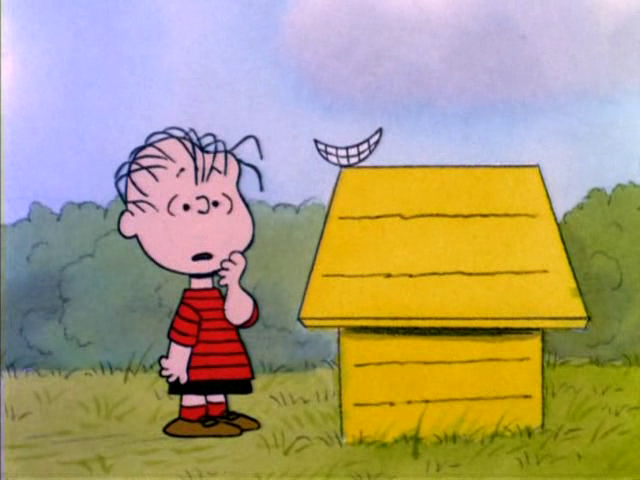 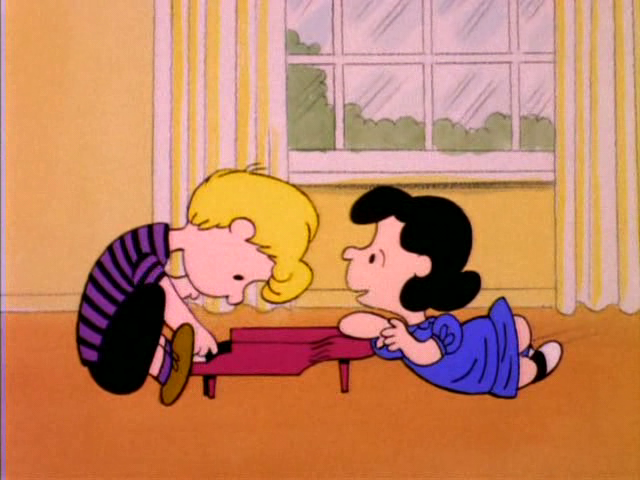 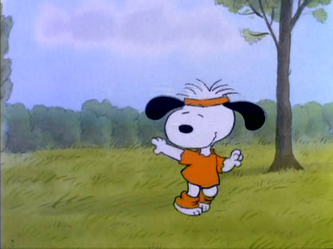 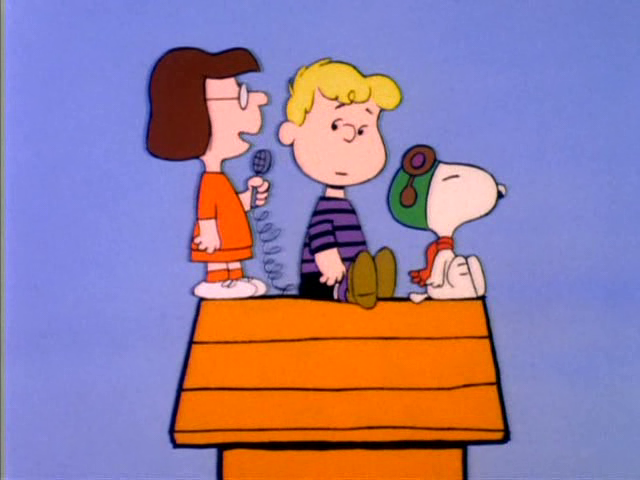 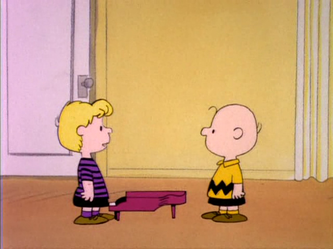 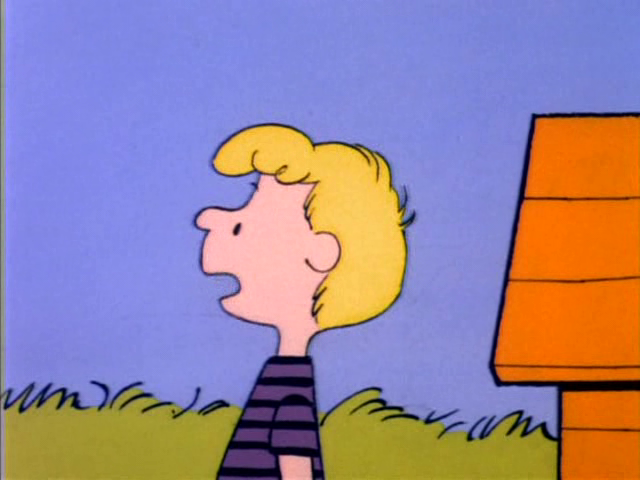 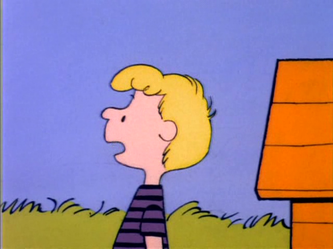 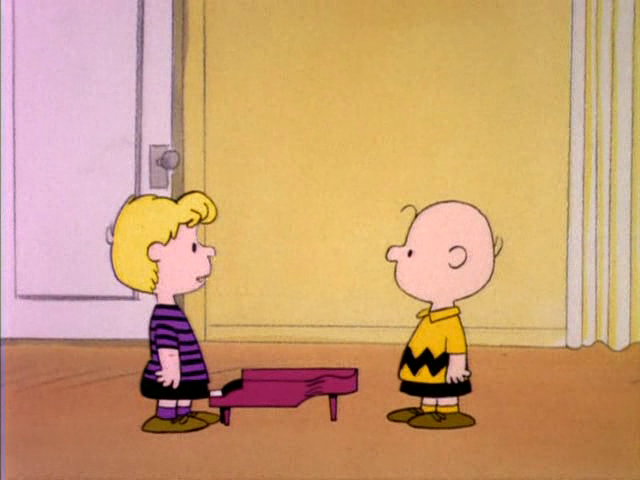 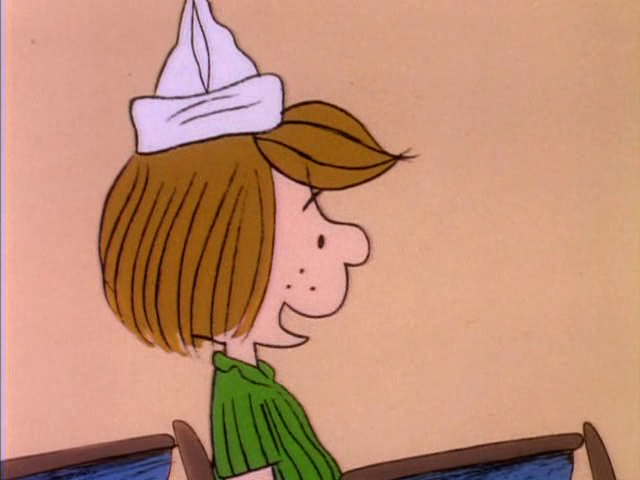 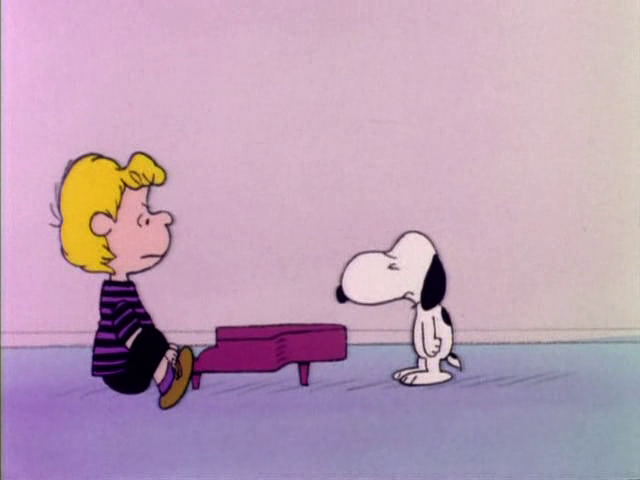 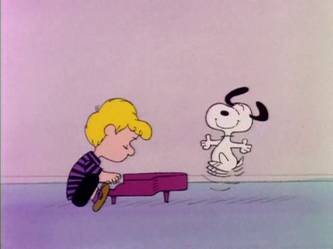 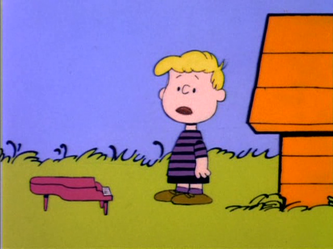 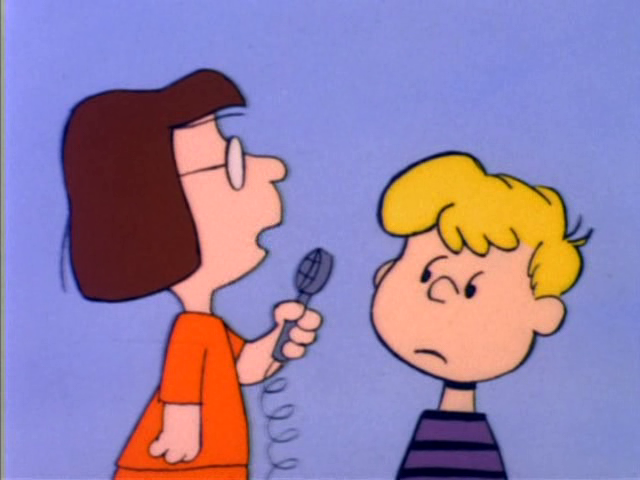 When the trip was over, Schroeder found out that he didn't go anywhere, and he blamed Lucy for booking him on the flight when she asked him how music camp was.